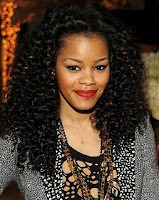 Hair Extension Hairstyles and Information: Remy Hair extension guide-What is Remy Hair? Remy Hair extension guide-What is Remy Hair? .Non-remy hair, is usually put through chemical processing which usually leaves it dull so it is usually coated with silicones to give it a nice sheen. Once the non-remy hair is washed, however, the silicones are removed and the hair looks dull. Remy hair keeps looking good even after the hair is washed as it does not depend on the silicone coat to give it a nice shine, it wasn't chemically processed to take away the shine. Non-remy hair also get tangles much easier than remy hair due to the fact that the cuticles lie in totally different direction. Remy hair weft can be hand tied or machine sewn. The hand tied wefts, is cut, can be sealed to significantly reduce any shedding/fraying that may take place.The adhesive used in sealing usually dries in about 30 minutes but it usually requires that you don't wet your hair for 5 days after sealing. 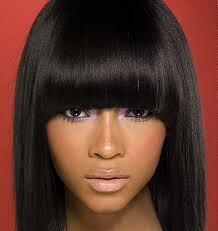 Remy hair can also be sold in packs or you can buy it ounces. Typically about 2 packs are needed for a full head sew in but you can use 2 and 1/2 - 3packs of hair if you want you hair to look really thick. To take care of remy hair you must be careful to use a sulfate free shampoo and use conditioner as you don't want to strip the hair. Also use cold water for washing you hair, it will make make it look better and last longer. After that you can apply a styling serum or leave in conditioner to the extensions and allow it to air dry. if you are working with a small amount of time you can use a hooded dryer but be careful not to use very high heat, it'll cause damage and shorten the life of your weave.